It almost feels like a cabin you might find in Northern Quebec country. It’s warm and intimate, a welcoming feeling on a cold day. At McGill’s Macdonald campus, located in Sainte-Anne-de-Bellevue, the shed is filled with giant saws, axes of all kinds and huge stacks of wood that certainly aren’t there to be someone’s kindling. The shed, along with a snowy field of throwing axe targets and climbing poles serve as home base for the McGill Woodsmen. More specifically, the cold field is the Woodsmen’s training ground, not the most appealing prospect in the middle of winter. Though this doesn’t seem to be an issue for the university lumberjack team. 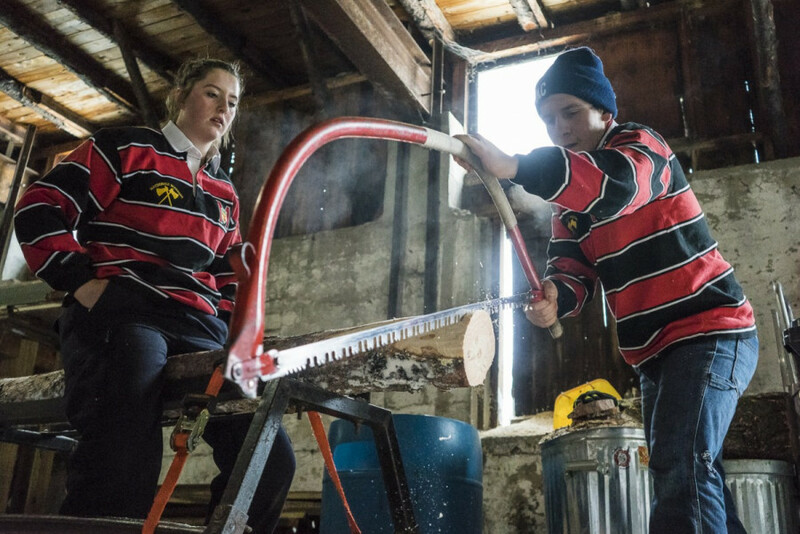 “I come from a farm, I love working out in nature […] being outside and training is what gets me going,” said Woodsmen co-coach Stéphanie Bélanger-Naud. Exactly what Bélanger-Naud and her teams do is not quite as well known as McGill’s basketball, football or hockey teams. But don’t let that fool you into thinking that what they do is any less intense or competitive. McGill’s women’s team are the reigning champions after winning first overall in 2017 and are on a strong path to repeat after second and first place finishes in the first two competitions of the season. The Woodsmen are four teams of lumberjacks and lumberjills that compete in intercollegiate lumberjacking competitions across Canada. “I usually say, “well we chop wood”,” rookie Leslie Mackinnon said with a laugh, describing how she tries to explain the sport to people. While wood chopping may be at the heart of it, the simple description doesn’t quite fully describe the immense technicality and high intensity of the sport. 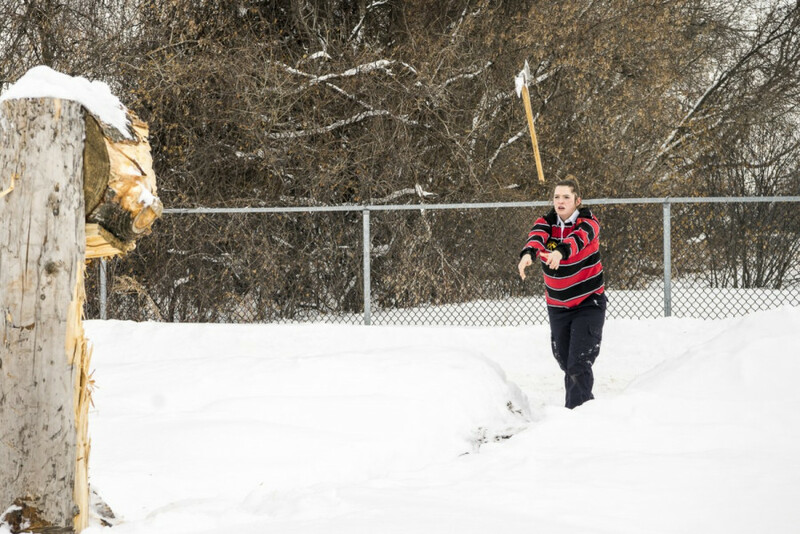 Teams like the Woodsmen do everything from basic chopping to axe throwing. Competitive events geared towards celebrating the history of lumberjack culture include things like log rolling, pulp tossing, fire building and speed sawing. The competitions that McGill’s four Woodsmen teams—two men’s teams and two women’s—take part in four times a year get right to the heart of lumberjack culture and look to celebrate the unique way of life and its roots in Canada’s history. He’s certainly not wrong about the industry. 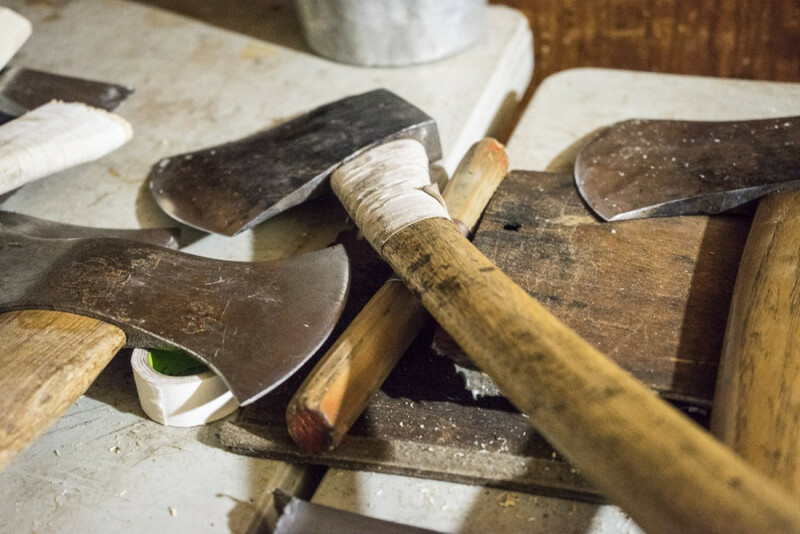 The Woodsmen’s shed is filled with specialized axes and saws for competitions costing upwards of $600. Along with the adoption of the lumberjack culture, the Woodsmen have made sure their team is a family. A group of individuals connected by a bond of deep love and passion for a sport that takes a great deal of commitment and hard work without the glamour that comes along with what some might call, the more traditional sports. “I’ve felt a deep connection to my fellow athletes unlike any other sport,” said Salama-Siroishka. The sentiment is echoed by his teammates many of whom, like Salama-Siroishka, have spent time in other sports before entering the world of lumberjack competition. The woodsmen seem to attract all kinds of members. 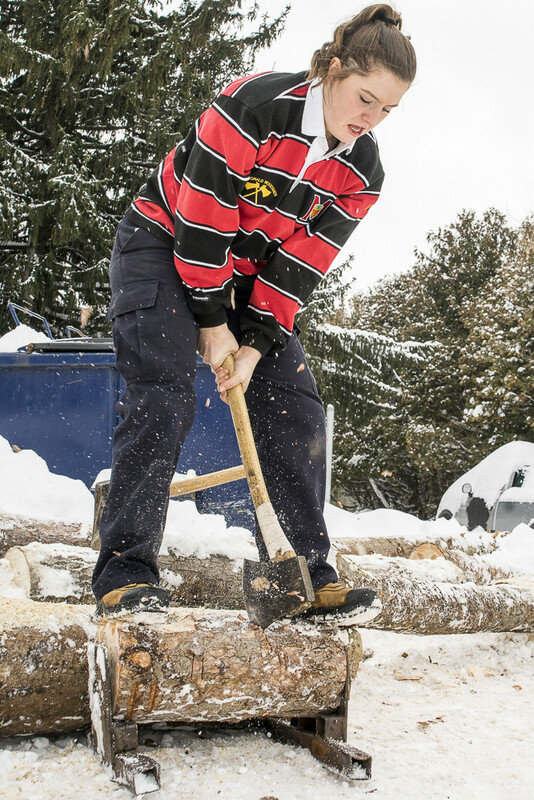 Whether you’ve graduated from the school, or you’re still competing, you’re a Woodsman forever. Regardless of program, age or whether you live a few blocks down like Salama-Siroishka, or need to take the long drive out to Macdonald campus for early morning practices, all McGill students are welcome. As much fun as that family is, the workload for these athletes is heavy. Most days, they’re working at the crack of dawn. “We have everyone come out to practice four times a week, Monday to Thursday. We practice from 6:00 to 7:30/7:45 AM. Every team goes through their events in the morning,” says Bélanger-Naud. These early practices not only keep the athletes in the shape needed for their competitions but let them refine the technical aspects of their performance. How do you get the rotations of the axe during the axe throw just right? What’s the trick to combining the speed and accuracy needed to win the pulp toss event? Guiding the team through the mechanics of the sport is Bélanger-Naud, who came on as one of the team’s coaches partway into the season. After five years as a member of the team and two years in the professional circuit, the veteran lumberjill certainly knows what she’s doing. “It’s amazing. She’s one of the most talented athletes I’ve ever met,” said Salama-Siroishka. Bélanger-Naud’s professional experience began when she realized just how hard the lumberjack bug had bit her. Two years since then, the former Woodsman is a major source of confidence for the teams she’s coaching. “It’s reassuring to have a stable coach who knows what she’s talking about and isn’t afraid to tell you “you need to fix that”,” says Mackinnon, a second generation Woodsman whose father competed with the team during his years at McGill. Yet despite the pedigree of Bélanger-Naud and the hard work of the Woodsman, there is still a level of obscurity for the team in the minds of many. The Woodsmen do their best not to let it get to them. It’s almost a mark of pride for the athletes who get to give an in-depth, insider view of their passion to those that know little to nothing about it at first. However, as Salama-Siroishka notes, it can be difficult when the sport they pour so much into is out of the limelight. “It’s a shame. You don’t feel as recognized as other sports […] It’s a really nice feeling to introduce somebody to the sport but at the same time you wish more people knew about it so you could get more exposure for people,” said Salama-Siroishka. 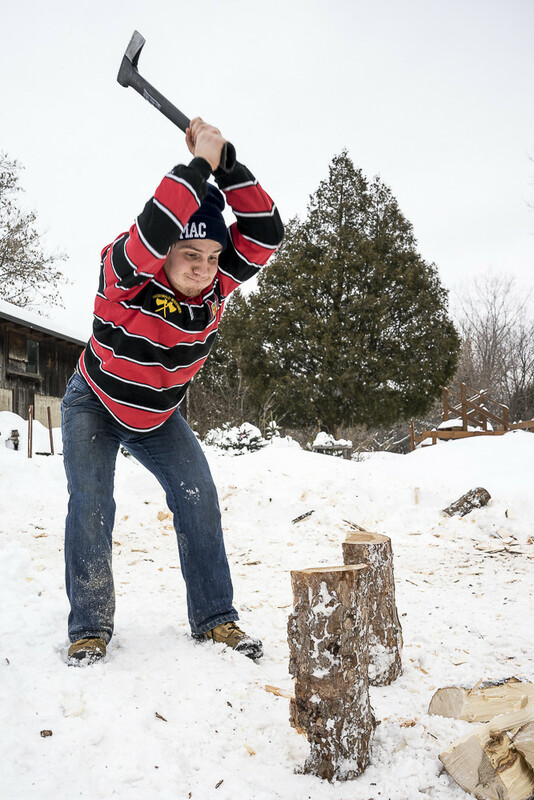 The one way that the teams do draw notoriety is by participating in the two fall and two winter competitions organized by the Canadian Intercollegiate Lumberjacking Association. CILA’s competitions range across the Eastern half of Canada, drawing large groups of both fans and competitors. To give a sense of just how big these competitions get, while there are only six schools represented, many have multiple teams like McGill. Each team has six athletes plus an alternate. If a school has four teams, like McGill does, then that adds up to 28 people. Multiply that by six and add coaches, staff and fans. The competitions are major events. Just like other university sports, they can get pretty intense too. These teams go head to head through 12 events plus a special event that changes every competition. With teams being judged on how quickly they make it through these events, there isn’t much time to become best friends with opponents. After each competition, winners are named and the total times are added up at the end of the year when an overall winner is named based on the lowest overall time. The teams have plenty of reason to be excited for the upcoming penultimate competition of the year. On Jan. 27, the Woodsmen will host CILA’s third competition of 2017-2018 at McGill’s Macdonald campus. Being the host team brings its ups and downs according to the team. For one, the expectations are certainly higher than usual. “You know more people there. Everyone’s families come down so there’s more pressure,” said Mackinnon. As much as the hometown crowd may add to the pressure, the Woodsmen seem over the moon at the prospect of getting to show off their talent in front of family and friends. As much as they may feel more pressure because of it, the team has nothing but good things to say about hosting the competition. They’ve amped up their practice schedule, prepared competition wood and seem to jump at the chance to go toe to toe with the other schools on home turf. The competition begins its opening ceremonies at 8:45 AM, Jan. 27 at MacDonald campus in Sainte-Anne-de-Bellevue and will conclude around 5PM.